This days payable outstanding calculator can be used to calculate the average number of days a business is taking to pay its suppliers. Accounts payable represent amounts owed by a business for goods purchased on account from suppliers. In order to monitor the level of accounts payable it is useful to calculate how many days cost of sales the accounts payable represents. This value is referred to as days payable outstanding (DPO), and shows the average number of days the business is taking to pay for goods purchased on account. Days payable outstanding is calculated using the days payable outstanding formula, which divides accounts payable, taken from the balance sheet, by the average daily cost of sales, taken from the income statement. In our tutorial on how to determine days payable outstanding we discuss the DPO calculation, and its use in the Financial Projections Template. Enter the cost of sales. This is the value of cost of sales taken from the annual accounts or management accounts. Enter the period. This is number of days in the period, for annual accounts 365 days is used. The DPO calculator calculates the average daily cost of sales for the period. Enter the accounts payable. This is the accounts payable (creditors) taken from the balance sheet of the accounts. If opening and closing balances are available, then the average accounts payable balance can be used. The days payable outstanding calculator calculates the average days payable outstanding. The DPO calculator is available for download in Excel format by following the link below. The days payable outstanding figure calculated by this template can be used as one of the inputs for our Financial Projections Template, which provides the financial section for a business plan. Users use the days payable outstanding spreadsheet to calculate days payable outstanding at their own risk. We make no warranty or representation as to its accuracy and we are covered by the terms of our legal disclaimer, which you are deemed to have read. 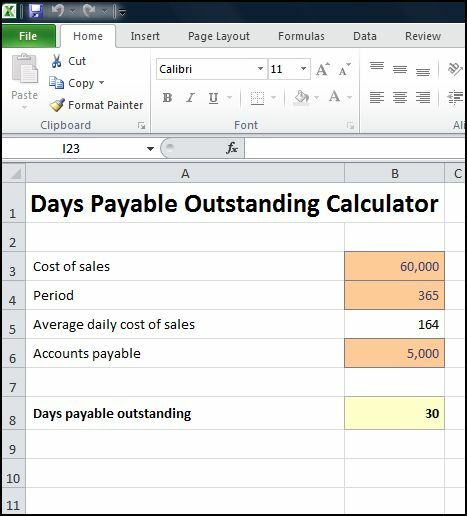 This is an example of days payable outstanding forecasting software that you might use when drawing up a business plan. It is purely illustrative of a days payable outstanding formula calculator. This is not intended to reflect general standards or targets for any particular company or sector. If you do spot a mistake in the days payable outstanding business plan template, please let us know and we will try to fix it.